This hilarious relay is great for any size group. If your group is large, divide into teams of five or more players. If your group is small, divide into two teams and repeat the relay two or more times to determine the winning team. Have each team form a straight line with each team member down on all fours (like a dog) facing forward. Give group members each a pinch-type clothespin to put in their mouth so the clothespin can be opened and closed with their teeth. Put bowls with 10 to 12 dog biscuits in each on the floor in front of each team's line. 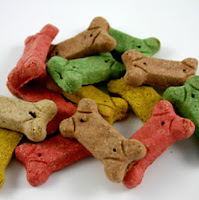 The first person in each team's line must take the dog biscuit out of the bowl, one at a time, using the clothespin in his or her mouth. The biscuits are then passed on to the next person and so on down the line. If a biscuit is dropped, the person who dropped it must pick it up with the clothespin. No hands are allowed at any time. Teams must stay in a straight line and remain on hands and knees throughout the relay. The first team to put all it's biscuits in the bowl at the end of the line wins.